Hello adventurous makers! Today I want to show you how to make some super easy wedding favors. We are going to start by making some lip balms. Easy favors for the happy couple. You may be wondering what “K.I.S.S.” stands for. It means Keep It Simple Sam. We want to make these favors as simple as possible. Weddings can be super stressful! We don’t want to make anything more crazy by making intricate wedding favors. 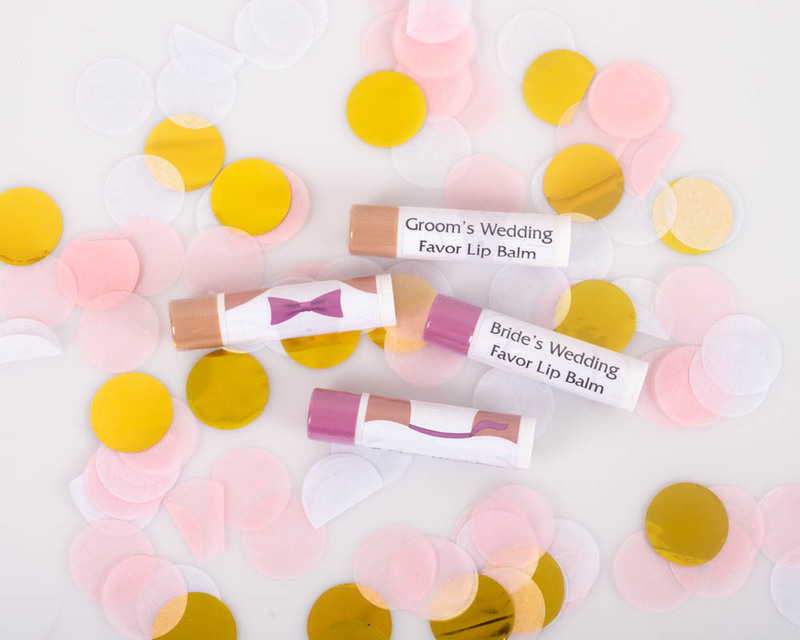 You can make favors using our bases, and all the wedding guests will think you slaved away all week making lip balms and lotions! I got all of these made in a couple of hours, and I made A LOT. We had our graphics department whip us up some simple but elegant wedding favor labels. We made a couple of different designs so you can see how versatile these labels can be. We designed generic labels that just says Bride’s Favorite Lip Balm or Groom’s Favorite Lip Balm. It is your decision how personal you want the labels to be. You can choose what colors you want for the wedding favors and design accordingly. If you are making wedding favors and want some of these labels, contact our graphics department. We would be happy to help you. For the bride’s lip balm, we chose to use the flavor blend from a past blog named Blueberry Lemonade Lip Balm – I used 1% Blueberry Flavor Oil, 1% Lemon USA Essential Oil, and 2% Sugar Baby Flavor Oil. For the groom’s lip balm, we used the flavor blend from a past blog Manly Balm Lip Balm, and I used 1% of the flavor blend. Because I am trying to keep it simple, I decided to use our Shea Lip Solutions Base rather than making up my own formula. I made 5 pounds of each flavor, which makes just around 1,000 lip balms. It’s crazy, I know. I will be sending these samples to our shipping department, so be sure to request a sample with your next order!